To contact the Town Mayor, please contact Julie Trinder via our General Enquiry page. 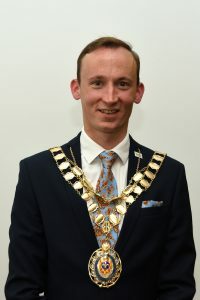 Councillor Sean Gaul took over as Bicester’s mayor in May, he talks here about his plans for the year and the charities he will support. The year will be a family affair as Cllr Gaul is supported by his wife Louise, who is mayoress, and occasionally the couple’s son Miles, (age 3) who will also help from time to time. By day Cllr Gaul runs a new vehicle sales department in Milton Keynes, and in his spare time is a town and district councillor. The former Glory Farm and Cooper School pupil said being elected as Bicester’s mayor was “deeply humbling” and he is keen to use the year to promote the town centre and his three chosen charities, Rainbow Pre-School, OYAP and Macmillan. Reflecting on his first three months, he said: “It is difficult fitting in all the mayoral and councillor duties with the day job, but I think it is very important that the people of Bicester are represented by a wide variety of people which includes the young and not so young, male and female, working and retired and so on. “With the support of the fantastic staff at Bicester Town Council and my very talented wife Louise, my year will be dedicated to Bicester’s town centre and to raising the profiles of my chosen charities Rainbow Pre-School, OYAP and Macmillan. “I am keen to support a project Rainbow is working on to upgrade their garden facilities so our very youngest can have the best possible start to life. One of the main projects he has pledged support for is the SEE Bicester campaign, Shop Enjoy Experience Bicester, which is run by Bicester Town Council in partnership with Bicester Village and Bicester Vision and supported by Cherwell District Council which aims to encourage more people to use the town centre. Activities have so far included a volunteer litter blitz day and films are being made about local business owners. In the coming months culture and art events will also take place in the town.